偶像活动! Photo on stage!! /アイカツ! フォトonステージ!! /Aikatsu! Photo on Stage!! スマホアプリ『アイカツ! フォトonステージ! 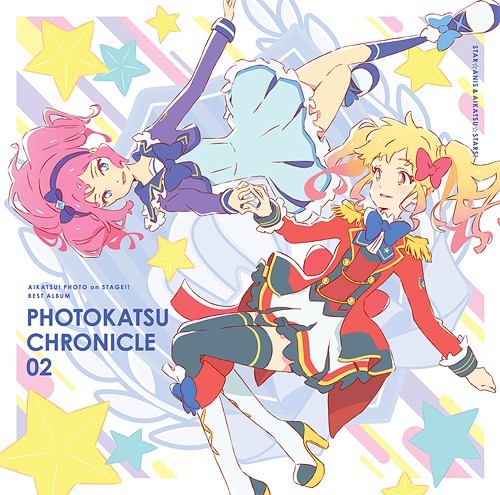 !』ベストアルバム PHOTOKATSU CHRONICLE 02 / STAR☆ANIS、AIKATSU☆STARS! SWEET SWEET GIRLS' TALK / RISUKO.REMI.ERI from STAR ANIS & RUKA from AIKATSU STARS! Sweet Sweet Girls’ Talk / りすこ・れみ・えり from STAR☆ANIS&るか from AIKATSU☆STARS! KIRAKIRA SENGEN / WAKA.FUURI.YUNA.REMI.RISUKO from STAR ANIS & RUKA.MIHO.RIE from AIKATSU STARS! キラキラ宣言 / わか・ふうり・ゆな・れみ・りすこ from STAR☆ANIS&るか・みほ・りえ from AIKATSU☆STARS! HOSHIZORA NO FUROA / WAKA from STAR ANIS & RUKA from AIKATSU STARS! 星空のフロア / わか from STAR☆ANIS&るか from AIKATSU☆STARS! AIKATSUMERODI! / WAKA from STAR ANIS & RUKA.SENA from AIKATSU STARS! アイカツメロディ! / わか from STAR☆ANIS&るか・せな from AIKATSU☆STARS! JEWEL STAR FRIENDSHIP / RUKA.NANASE.KANA.MIHO from AIKATSU STARS! Jewel Star Friendship☆ / るか・ななせ・かな・みほ from AIKATSU☆STARS! NIJIIRO ENCORE / REMI.FUURI from STAR ANIS & MIKI.NANASE from AIKATSU STARS! 虹色アンコール / れみ・ふうり from STAR☆ANIS&みき・ななせ from AIKATSU☆STARS! TOKIMEKIANTENA / RUKA.RIE.MIKI from AIKATSU STARS! トキメキアンテナ / るか・りえ・みき from AIKATSU☆STARS! KINDAN HIDE & SEEK / REMI.FUURI from STAR ANIS & RIE from AIKATSU STARS! 禁断 Hide & Seek / れみ・ふうり from STAR☆ANIS&りえ from AIKATSU☆STARS! WE ARE STARS!!!!! / SENA.RIE.MIKI.KANA.NANASE from AIKATSU STARS! We are STARS!!!!! / せな・りえ・みき・かな・ななせ from AIKATSU☆STARS! Performer: Risuko, Remi, Eri from STAR☆ANIS & Ruka from AIKATSU☆STARS! Performer: Waka, Fuuri, Yuna, Remi, Risuko from STAR☆ANIS & Ruka, Miho, Rie from AIKATSU☆STARS! Performer: Waka from STAR☆ANIS & Ruka from AIKATSU☆STARS! Performer: Waka from STAR☆ANIS & Ruka, Sena from AIKATSU☆STARS! Performer: Remi, Fuuri from STAR☆ANIS & Miki, Nanase from AIKATSU☆STARS! Performer: Ruka, Rie, Miki from AIKATSU☆STARS! Performer: Remi, Fuuri from STAR☆ANIS & Rie from AIKATSU☆STARS! Performer: Sena, Rie, Miki, Kana, Nanase from AIKATSU☆STARS! GMT+8, 2019-4-20 20:23 , Processed in 0.166457 second(s), 27 queries .